Here’s another one you can try on your kids for Halloween: Turtle poop soup. 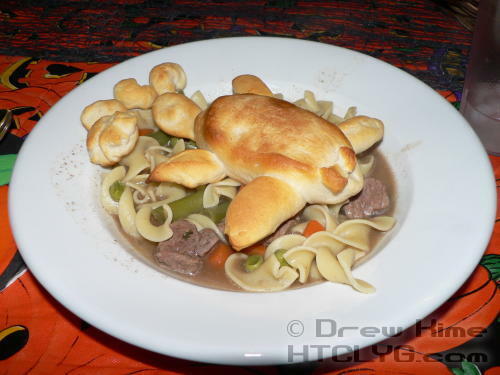 Just take your biscuit dough and form it into the shape of a sea turtle. (This might have started out as a spider, but long skinny legs were too hard. Maybe.) Then a few “nuggets” to follow along behind. Float them on top of beef stew, and that’s it. UPDATE: Oh no. I goofed. Those weren’t turtles. That was what I thought they looked like. According to the girls it was actually … Rat Stew. Sorry for the misunderstanding.